Date: Thursday 22nd March 2018 at SEGRO Plc, 258 Bath Road, Slough. SL1 4DX*. Volunteering empowers and has mutual benefits. Volunteers can enable young people.. our future workforce… to make informed choices about their career pathways and develop skills to give them the ability to benefit themselves in the workplace, or life in general. – SEGRO Plc who works in partnership to deliver tangible and positive impacts for the communities and local residents, specifically with employment. – Learning To Work who create high impact activities with local employers to inspire young people, educate them about opportunities and give them the skills they need to be successful. “The UK is facing a skills emergency. Weaknesses in supporting young people into the labour market have existed for years, but the changing nature of jobs and skill needs have turned the situation critical”. (Source: Carolyn Fairbairn, CBI Director-General December 2018). The CBI will be campaigning for reformed careers advice in schools and to ensure every young person gets quality guidance and at least 4 interactions with working life by the age of 16, in every nation of the UK. The event is FREE to SBCP paid members/charities and only £25.00 to non-members. *Please note there is no guaranteed parking at SEGRO, however limited parking opposite may become available nearer the time – we will keep you informed. **Please advise if you have any special dietary requirements. Slough Aspire, 350 Edinburgh Avenue, Slough, SL1 4TU. 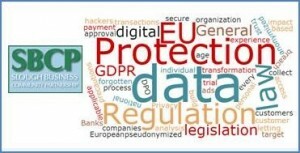 You will hear about the EU’s General Data Protection Regulation (GDPR) from leading law firm, Blake Morgan LLP. GDPR will apply from 25th May 2018. The new law marks a wide-reaching and significant shift in the way that organisations must protect personal data. 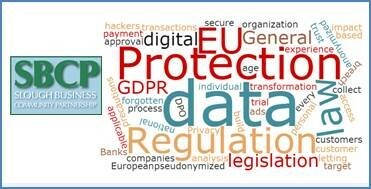 It grants data subjects a number of new rights, including the right to judicial remedy against organisations that have infringed their rights, and requires organisations to adopt “appropriate technical and organisational measures” to protect personal data. It also introduces mandatory data breach reporting. You will also hear from hear from Thames Valley Police’s Specialist Operations team, who will be presenting on Cyber Crime. Please note parking at Slough Aspire is very limited but visitors can use the free parking just minutes away at Malton Avenue car park.